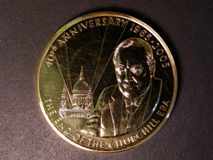 1219 Tahiti Commemorative Medal by Georges Guiraud, bronze, 53mm dia., obv. busts of Wallis, de Bougainville & Cook, rev. sailing ship with names Dolphin, Boudeuse & Endeavour around edge. 20th Century manufacture, GVF.